Some of the most stylish boys’ names are word names, and some of those names are verbs. Action verb names. It feels right for a little boy, doesn’t it? 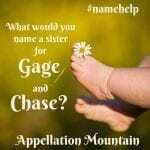 Names like Dash or Chase fit with our image of boys, running down the sidewalk or pedaling a bike as fast as possible. Of course, your Dash could be a bookworm. And Chase might be more into building with Legos than competing in track and field. But none of it dulls the charm of the more mainstream names. Some choices might go too far. Zip is a nickname, and maybe a fun one. But it seems a little out there for use as a given name. Others, like Jack and Max, have a verb name undercurrent – jack up, max out – but they don’t naturally seem to belong in this category. If you’re after an active choice, there are plenty of possibilities to consider. 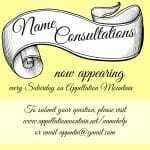 Let’s start with names with such a long history of use that we don’t often think of them as verbs. Grant – He has a generous meaning – to give, to allow – and at #163, fits that familiar, but not popular, category many parents seek. Mark – We think of this as a Biblical classic, but Samuel Clemens took his pen name from the phrase “Mark Twain.” Once wildly popular, Mark now stands at a relatively underused #176. Lance – He’s a little bit of a medieval knight, but he’s also a well-established choice for twentieth century boys. Lance has fallen to #496 in 2012, but he remains a piercing possibility. Wade – He had a good run in the 1950s and 60s. Today he’s been eclipsed by cowboy Cade, but that makes Wade feel almost classic. And he’s definitely an action verb, too. In 2012, Wade ranked #553. Chase – The most popular of the modern verb names, Chase was once a surname for a huntsman. Today he feels like a preppy borrowing – think of Chase Manhattan bank. He ranked #77 in 2012. Jace-inspired spelling variant Chace is also in use. Gage – Alright, Gage isn’t really a verb name. It’s a surname name, boosted by a Stephen King novel. At #172, he’s pretty popular. But Gage does come from a word meaning to measure, and the occupation of assayer – an official who ensured the accuracy of weights and measures used for trade. The typical English spelling of the verb is gauge. As a given name, Gauge ranks in the 700s. Jett – The double ‘t’ spelling is more Joan than wild blue yonder. But jet is a different story. With one ‘t’, to jet is to fly, and a jet is how you do it. Jett ranked #344 in 2012. Jet is sometimes used, too, and it can also be a color name, from the mineral lignite, better known as jet. Or jet black. Add an ‘e’ and Jette is a surname name from the French verb “to throw” – bestowed upon children who were abandoned. Case – A case is an object, a box or folder for carrying things. Or maybe an example – in the case of … But Case could be a verb, if one with a criminal bent – if you’re casing a joint, you’re inspecting the premises, probably before breaking and entering. Case ranked #502 in 2012, and Kase is also in the Top 1000. Parents are probably choosing him not for his meaning, but for his trendy Jace/Trace/Chase sound. Ace – Jessica Simpson gave this surprisingly meaningful name to her son a few weeks ago. Ace ranked #524 in 2012. 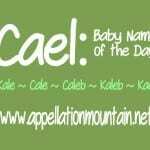 In 2013, he could mean “crazy celebrity baby name” or to ace – to succeed, to excel, to win. It’s an appealing meaning for a child. Tripp – He was long a preppy nickname for a III. (Think Charles Cabot Ellis III, but call me Tripp.) Then along came vice presidential hopeful Sarah Palin and her creatively named brood. Tripp is Sarah’s first grandson, the child of her daughter, Bristol. Men have answered to Tip and Flip, but it is Tripp that seems wearable. As verbs go, Tripp seems unflattering – a reference to clumsiness, or maybe drug use. But until the 1400s, to trip was to step lightly, to skip – as in “trip the light fantastic.” The more modern meaning might be a stumbling block for some parents, but others are embracing him. Blaze – The saintly Blaise has a longer history of use, but the fiery Blaze is more popular. With a z, this name ranked #752 in 2012, while the -ise spelling lagged at #918. Foster – He ranked #995 in 2012, just inside the Top 1000. But Foster, with his r ending, could be going places. And his meaning is a pleasing one – to foster is to encourage, to nurture, to help grow. Cash – We cash checks, so cash definitely has a verb vibe. But Cash owes his popularity more to the surname of singer Johnny Cash and possibly the almighty dollar. This ever so cool surname name might be related to Kirsch – from the German word for cherry tree, a very different image. Cash ranked #270 in 2012. Cruz – Okay, this is the Spanish word for cross, and a common surname in the Spanish-speaking world. But it sounds just like cruise, as in Tom, and a verb, meaning to cross. Oh, wait – Cruz and Cruise aren’t so very different after all. Except Cruz was given to over 1,220 newborns, while just 18 boys were named Cruise. Trace – Yes, Trace owes his success to country music’s Trace Adkins. And yes, Mr. Adkins’ given name is Tracy. But while Tracy seems as feminine as Ashley to a 2013 audience, Trace feels more like Jace and Case and Trace – in other words, perfectly masculine. Trace ranked #634 in 2012. Aim – The sound appears in established names like Amy and Amos, as well as surname name Ames. Aim – as in ready, _____, fire – has possibility. 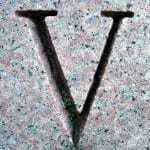 With its imagery of goal-setting, it fits with modern virtue names. Believe – Too new age? If Faith and Hope are virtue choices for girls, maybe Believe has possibility. Brave – We brave the elements, we brave adversity. With its resilient image, Brave might make an appealing middle. Benjamin Bratt has a son called Mateo Bravery. Bridge – The name Bridger is surprisingly popular in the Mountain West, thanks to a mountain-dwelling explorer named Jim Bridger. Just Bridge feels a little more active – and yet just as wearable. Chart – Something about Chart sounds like a name. Plus, charting a path is a positive association. I suppose medical charts are less than inspiring. But he could still work. Climb – The trouble with Climb in the middle spot is that it feels like a command. David Climb Smith. Matthew Climb Harrison. And I just don’t hear him as a first name. But something compelled me to keep him on the list anyhow. Dash – He’s currently unranked, but Dashiell is an up-and-coming literary option. Disney-Pixar’s The Incredibles featured a fast-running boy, appropriately named Dash. Gather – Gather strikes me as a name with heavy Christian overtones, a brother for Nevaeh. Lead – Led is a non-starter, but Lead – rhymes with Reid – has some possibility. Link – He’s a short form of Lincoln, a video game hero, and a word full of connection and possibility. Pace – To pace is to walk. It can convey anxiety – pacing back and forth – or a steady rhythm – pace car, pacemaker, set the pace. Pacey on Dawson’sCreek put the sound on the map for boys, and Pace owes some of his use to the rise of Trace, Jace, and company. Pilot – He’s on every list of bad baby names, but Jason Lee’s little guy actually has a pretty cool first name. And while it brings to mind the occupation, we do pilot planes – making him an action verb name at least as sky-worthy as Jett. Pioneer – Does this seem like a crazy thought? Maybe it is. Pioneer has never been given to more than five boys in any year for which the Social Security Administration keeps data. But I did find two Pioneers in the Census records, and in our era of ends with -r names for boys, I wouldn’t be surprised to see him. Pioneer can be a noun, or a verb – to pioneer. Or an adjective – pioneering advances in science. Reason – Like Pioneer, Reason is rare as a given name – though eight boys received the name in 2012. There’s a little bit of a modern virtue vibe to Reason, and his sound is consistent with so many ends with -n choices for boys, from Aiden to Rowan. Sail – Spelled sale, he’s less verb and more bargain bin. But Sail has all the nautical appeal of Sailor, and somehow seems more masculine, too. Sway – Rapper turned radio and television music journalist Sway Calloway gives this name some serious style. Sway can mean to glide – or to persuade. Spike – Ever since Mike Myers used this one for his son, I’ve been wondering if we’ll see, well, a spike in boys with this name. As a noun, a spike is a big ol’ nail. As a verb, to spike can be a term for scoring in volleyball, the act of fastening something with a spike, or to add booze to a non-alcoholic drink. As a boys’ name, it feels pretty aggressive. Track – He sounds like one of Sarah Palin’s kids. Er, wait … he is one of Sarah Palin’s kids, her firstborn. Track refers to mom’s love of running. He’s rugged and outdoorsy, but not quite over-the-top-masculine. File him somewhere between Cedar and Slade. Judge – Yes, there’s Judge Reinhold, his first name mocked on Arrested Development. His real name is Edward, but Judge is a childhood nickname that stuck. It’s also been steadily used for boys. 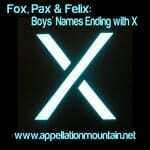 Since the 1880s, most years between a dozen and two dozen boys have been given the name. Win – Too obvious? Wynn, Wynne, Winston and Winton all share the verb’s winning sound. Unify – If Romeo and Juliethad been a romantic comedy with a happy ending, Unify would be their baby boy’s name, a Shakespearean Renesmee. Otherwise, this one is kind of daffy, and very seldom heard. But he might make a meaningful middle for parents after a modern virtue choice. Are there other verb names that could work for a boy? Would you use any of these in the first spot? How ’bout in the middle? 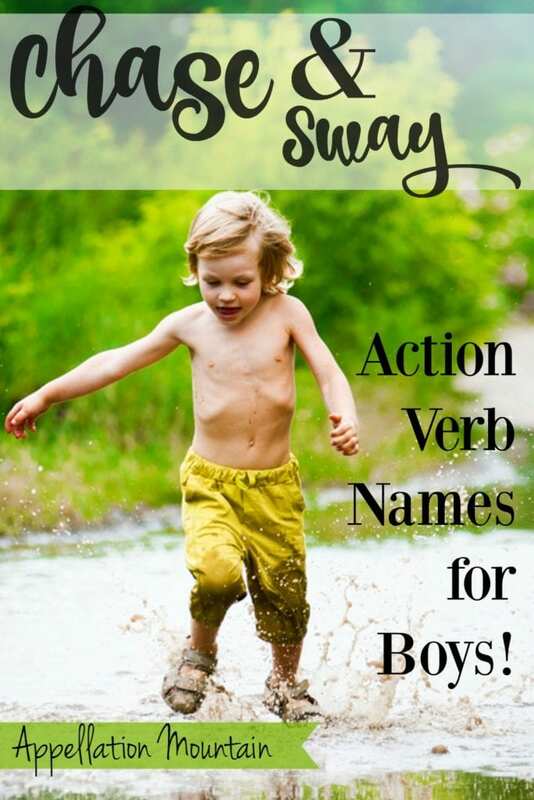 I find this an interesting trend, but a naming trend that perpetuates age-old stereotypes of boys as active and girls passive (Are there any/many action verbs used as girl names?) is not one I would support. I like the idea of the nn Aim from Amity. Two virtues in one. One of my cousins named his baby boy Race. This isn’t really my style of name and Lead makes me think of North Korea’s “Dear Leader.” So that’s a no-go. However, one action name I’ve considered is Traverse. Jette (YET-tuh) is a girl’s name in Denmark, Germany and the Netherlands. It’s a short form of Henriette and other -ette names. Pioneer reminds me of Rainier, very Pacific Northwest in flavor. It also has the music connection (Pioneer stereos). Pioneer seems like a big brother to a sweet little Prairie. Very much not my style, but an interesting read. Cool list! I like Brave and Reason, but my favorite verb names are Bloom and Prosper. My current favorite that I plan on using for a middle is Bond. Hmm. I was all set to like the names in here–We’re naming our son Wilder… but Cedar is the only one that really jumps out at me. Also Gage, but I have two friends with boys named Gage. And Grant, but that’s my BIL’s name. I feel like some of these are a bit too out there, might set the kid up for being teased. Like Sail (Sale) and Unify. I do love the spirit of this post though!